Government and Taxes: Pilipinas Forum 3: Is Marxism Still Relevant? These are the exchanges in pilipinasforum@yahoogroups that I edited, posted in inq7.net in March 12, 2001, 11 pages long. These discussions were made in February 2001. 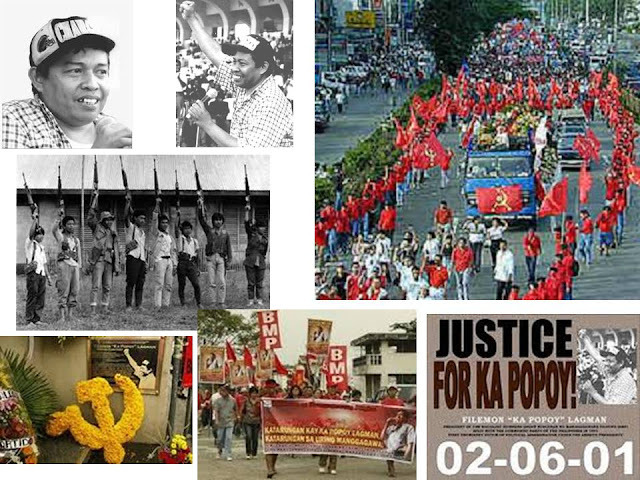 (1) They reject the "semi-feudal, semi-colonial" mode of production analysis of Joma and the CPP. (2) Hence, they also reject the "national democracy" goal. (3) They reject the Maoist formulation that "the peasants (not workers) are the main army to change society" and that of "encircling the city from the countrysides", and (4) Corollarily, reject that "armed struggle is the primary form of struggle". 1. The Philippines' mode of production is "predominantly capitalist". 2. Hence, the goal should be socialism, not "national democracy" ("national" meaning anti-colonial, "democracy" meaning anti-feudal). 3. The workers (don't own means of production, whether capital, factories, land, technology) are the main army to change things, and urban insurrection is the way to capture state power. 4. Other forms of struggle should be tapped to complement the armed urban struggle (Hence, Popoy and his group then advocated to participate in the 1986 snap elections, whereas Joma and the CPP called for its boycott). Between the two, Popoy is more sophisticated ideologically than Joma Sison. I would even add that Popoy read and understand classic Marxism and Leninism literature better than Joma and his followers. The ideological debate and organizational rivalry between the 2 largest factions of the Philippine left has somehow worked for their mutual advantage and the workers in general. Just like big corporations benefiting from having fellow big competitors because they all strive to be more dynamic and innovative. How? Organized workers have more options where they will be organizationally and ideologically affiliated. Before, it was only between the moderate TUCP and the radical KMU, plus other smaller independent labor federations. 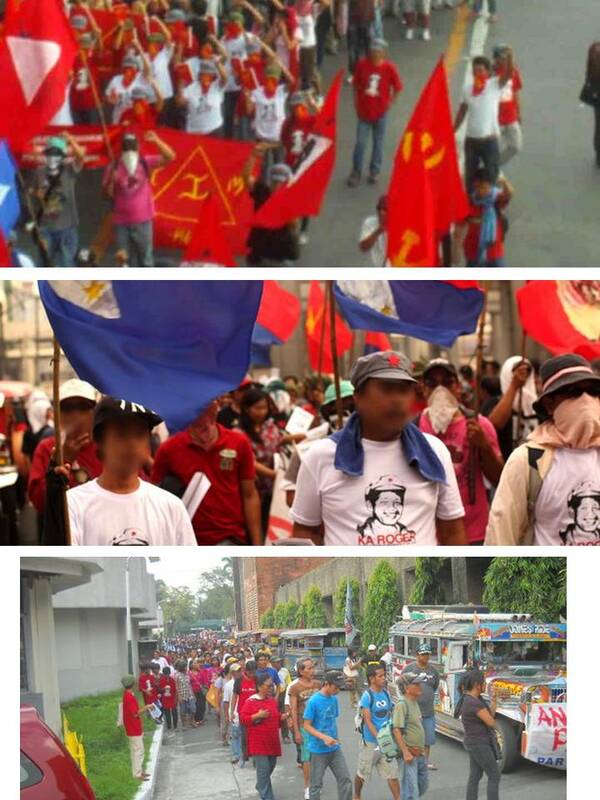 Popoy's BMP (bukluran ng manggagawang pilipino) represented a 3rd or 4th option for the workers. Just like businessmen and capitalists have options whether they'll be more active with PCCI or MBC or FPI or Rotary, etc. Second, workers should be given the opportunity to be educated of the socialist alternative, and not just the nat-dem goal. The capitalists and politicians of this country for many years have veered away from the Adam Smith and David Ricardo type of capitalism, so they (the capitalists) gave workers a really bad kind and experience of capitalism. Perhaps approximating the capitalism of the Industrial Revolution in Europe. At the time when Marx called religion "the heart of the heartless world, the soul of the soulless conditions, it is the opium of the people." (though rabid anti-Marxists only quote the last line and omitted the first 2 lines). Where to, Philippine left? Despite my sympathy and admiration for their hard dedication to politicize and mobilize people, especially the really poorer sectors of our society, I still cannot subscribe to their sentiment that we should immune or delink our economy from globalization and the world economy, that we should keep the protectionist veil and continue regulating many of our industries and the economy, that we should not privatize subsidy-dependent state corporations, etc. Thus, since I believe that economic liberalization and not protectionism and regulation is the way, and the Philippine left (& the left elsewhere in the world) believe otherwise, I think the Philippine left will remain as a significant political voice in our society, but there's no way that it can seize state power to implement its protectionist advocacies. Nonoy, could you expound more on the leftist agenda? What exactly do they want? Go down the road of North Korea or Cuba? Do not the events in Russia and China discredit the case for Marxism, Leninism or Maoism as the case may be? I am guessing that their ideology was formulated in the 70's - do they account for sweeping changes in technology such as the internet? There are more Filipinos working abroad (5 million I think) versus those in Philippine Manufacturing (about 2 million I think) so what is their role in this workers rebellion. How does that one go, "The path to hell is paved with good intentions" - socialism and communism do have their appeal but outside the Israeli Kibbutz I cannot see real sustainable successful models. -- Victor A. Limlingan Jr.
1.. Public or collective ownership of the means of production (factories through workers' co-ownership, land through community ownership, etc.). Note that private things like one's toothpaste, shoes, house and car will remain privately-owned for they are not "means of production". 2.. Central planning of the production and distribution of the basic needs of the people. Thus, just how many metric tons of rice, corn, fishery, livestock, etc. will be produced this year and the next 5 years will be determined by the state's central planners, and orders or quotas will be assigned to various workers' communes, farmers' coops or councils, etc. 3.. Multi-party system to avoid the pitfalls of one-party system in many socialist countries at that time incl. the USSR, Eastern European states, etc. As Raffy posted earlier, there's nowhere to find in classic Leninist writings that there should be only one proletarian party. "Bourgeois" or capitalist parties can be allowed in a socialist Philippines, as long as they don't take up armed challenges to the state. I forget the rest of the ingredients of the "socialist agenda", but those 3 are among the major ones. What the framers of that paper emphasized was that the pitfalls of totalitarian socialist states should be avoided. Thus, the document was made public to elicit public discussion, to erase the stigma of "hidden agenda" when cause-oriented groups deal with other moderate or non-leftist groups. My former roomate in Narra dorm in UP, Joey Tiangco, asked me, "bakit hindi ka na sosyalista?" My short reply is that I went back to economic theory, and I realized that the market can correct the many problems that we currently experience. Because these problems were not brought by a liberal and free market environment, but by distortions of the market through wide state regulations, interventions and protectionism in the economy. Right now, I really don't see the significance of communist ideology in the global economy. It really sounds obsolete especially for us, who claim to be a democratic nation. It just makes me wonder, what are doing? Why do we still have those hold overs? Why do labor unions always have to be left leaning? Why can't we just have a regular labor union furthering the workers' rights? This tells us only one thing, we have left our brothers toiling dirt while we bask in the pleasure of working in airconditioned buildings. Poverty? Lack of education? Ignorance? I don't know. Undoubtedly, there is unequitable distribution of wealth in the Philippines. While we are considered as a third world country, the Philippines fare in the top 10 countries with the most number of billionaires!!! How do we like that? There are 5 considered billionaires in the Philippines. Now, I don't blame the communists for their so-called socialism. Maybe, somehow, we have not really outgrown history. Maybe, I was wrong. Communism in the Philippines is not entirely outdated. When I was teaching and doing research in DLSU and UP in 1988, I stumbled on the concept of "Power". This powerful concept was articulated by Structuralist Marxist represented by Nicos Poulantzas, and his predecessor, Louis Althusser, both well-known theoreticians of the French Communist Party and Union for Democracy in the 1970s. But the concept itself has its underpinnings on Karl Marx's, "A Contribution to the Critique of Political Economy" and later "Das Kapital". Fukuyuma "The End of History" discussing the Hegelian notion of "History or Historical Progress" et al. So to recapitulate the simple issue: Where is the Philippine Left going? I think their intellectuals must visit Russia, China and Cuba, and see what had transpired there, and start a serious look at themselves. But not to despair, they should look at how Social Democrats and Democratic Socialists had transformed themselves in France, Spain, Italy and Germany and rest of W. Europe. Paul, I think you are right, people from the Philippine left should visit these places now. I had a good laugh and serious rethinking when I talked with the Vietnamese about the Philippine left. I was told that they often get invitations to come to celebrations of friends in the Philippine left but they don't bother to come. I asked them why and they told me that the leftist movement in the Philippines is quite obsolete. They have to reinvent themselves they tell me. Though the world is now in the so-called 'post-communist' era, structuralism (the concept that structure conditions outcome -- held by Marxists, Modern World System theorists, Dependency theorists and variants) remains a very influential and important tool in political and economic analysis, even in the international arena (like in assessing the Chiapas Awakening of 1994). I've also read Fukuyama's "The End of History". History may be ending in very prosperous societies but I think it's only beginning in impoverished countries. As the author himself asserted, while there are still fights to be fought, battles to be won, and goals to be achieved, history keeps on going. And I think today, history is far, far from its end. The ultimate agenda of the Left is to gain state power ... through the ascendancy ("dictatorship") of the workers or "proletariat." And this is primarily through violence or force (speaking particularly of Marxist Socialists or communists, under the dictum of Mao Tse Tung's "power grows out of the barrel of the gun"). However, wittingly or unwittingly, an item of the agenda was not explicitly said which is: that the "leaders" or Party would eventually dictate both the thoughts and the actions of the proletariat, among other classes subjugated. The moral justification of the rule of the proletariat is purportedly anchored -- according to Karl Marx -- on the "surplus value" due to labor being expropriated by the "capitalist" as the profit from economic activity. Such deprivation of the surplus value signifies the "alienation" of the worker from the fruits of his labor and the imperative to fight for "social justice". According to him, the feasibility of such ascendancy of the proletariat is found in "historical materialism." He meant history as at the level of matter, in contrast to Hegel's world of ideas or history of ideas. Marx subscribed to the philosophy of Hegel that progress comes only when an entity (thesis) is opposed by another (anti-thesis) resulting to the synthesis. But Marx veered towards seeing such "dialectic" in the actual, real world of human affairs. In a gist, Marx thought that the conflict between the landlord (royalty and nobility) and the peasant -- would graduate to the conflict of the bourgeosie ("capitalist") and the proletariat, and that the latter would overrun the former to signify progress in history. Marx thought that the source of power of the "capitalist" is private property (land and capital factors of production). So he concluded that with the eventual abolition of private property, society will be "classless" and members "equal" to one another. The state will eventually also become superfluous and just wither away." A critical look at Marx and his thought would show certain flaws. To start with, though he was a humanist, he had a very intolerant intellectual personality. And such was the inheritance of his progenies -- Lenin, Stalin and Mao Tze Tung. 1.. "Contradition" between the state/collective and the individual (since concretely, the state comprises individual citizens) -- non-marxists, like the American forefathers simply resolved this by coming up with the Bill of Rights. 2.. Plurality versus duality -- Marx thought that the only valid opposites were just two dominant forces and violent at that. He didn't believe in the resolution of various conflicts and interests through co-existence and plurality. Prudent leaders would strive to prevent conflict from degenerating into violence ("antagonistic contradiction"), but Marx in contrast would force the issue to a head (hence the tendency for Lenin's "agitprop" or agitation and propaganda -- i.e. provocation). 3.. Development and evolution of the market and technology -- such has led to "reciprocity" -- and convergence of the interest of opposing parties, e.g. the rational self interest of capitalists indicated the need for productive and aptly motivated and compensated workforce; the producers (employees) are also the consumers; the rank and file have also become capitalists in being able to buy shares of stocks, bonds by themselves or through pension and other mutual fund managers. 4.. Limitations of private property and profit -- as through taxation and plowback to production or investments, not to mention that the emerging dominant factor of production now is digital information and the internet (outshining the tradition factors labor and capital). 5.. Decentralization -- The need for decentralization, deregulation, divisionalization, etc. in capitalist-democratic nations is leading to more loosening of the state, while Marxist-Socialist states have to keep tight rein over their citizenry to perpetuate their power. 6.. Bureaucracy -- institutions and organizations have the tendency toward detrimental "functional autonomy" -- meaning developing an identity and needs which are distinct and even contrary to those of their members or constituencies, and even to the original purpose of public welfare. There are authors who heap praise on Marx for his "radical" ideas on political economy. But for me, no praise to him for his dogmatic ideas and when applied -- the unspeakable cost of human lives. There are tons and tons of critiques, theses against Marx and Marxism. "The powder of the bones of his ideas has been pulverized now and then." But it must be so -- for the safety of future generations. Marx was intolerant. Das Kapital remains the most comprehensive and theoretically coherent critique of capitalism. Lenin was an indefatigable reader, writer, polemicist, debater, labor organizer, and thinker. He listened to the old narodniks (city students who tried organizing the Russian peasantry) before concluding that the peasantry could never lead a socialist revolution, and observed Stalin before arguing that Trotsky was better suited to lead the Party. He patiently listened and discussed with his own partymates and won them over solely through the superiority of his ideas. No, Lenin was not intolerant. Stalin was neither an intellectual nor intolerant. He was, quite simply, mad. As for Mao, he was mad in a confucian sort of way. I do not consider Mao a Marxist in the true sense of the word, so he really does not count. The marxist conception of the state is not the collective of all individual citizens. The marxist state is the dominant class's entire apparatus for repressing the rest of society, including the police, the army, the courts, and the jails. Marx was a thinker of the 19th century, naturally circumscribed by the realities of his milieu. Of course he did not know of the internet. And neither did Plato and St Thomas More, I might add. But I agree that information is an emergent (or dominant?) factor of production. 1. Vast improvement of Vietnamese economy, particularly the agriculture sector, after they implemented "Doi Moi" in 1986; 10% of their GNP comes from Foreign Direct Investments. 2. The main features of their economic policy reform are (a) change towards a multi-sector economy; (b) commodity economy; (c)open-door policy; and (d) implement programs towards the production of export goods, consumption goods, and food products. Those who believe in capitalism are market oriented, i.e. go for free, voluntary exchange -- negotiation of values, not force or violence. They also appreciate that such economic system thrives in democratic society. The lofty ones would quote Voltaire: "I disagree with what you say, but will defend to the death your right to say it." Thus even Popoy Lagman had the right to be heard, not killed. Basically, all the lessons from Marxism, Popoy and their genre seem to be negative - they wanted to achieve something good (no doubt). They advocated a particular solution - which by all accounts was a dismal failure. The conclusion is simple - that their proposed solution does not work - do not try it. Is there anything positive to be learned? Something they tried which works? Something we can build on. Surely, such a powerful force must have some productive value. inherent in marxism itself? If this second case is true, then what are the core weaknesses of marxism? If marxism was valid once, but no more, then in what specific ways, for what specific causes, and at what historical juncture did it become obsolete? In the first place, what is marxism? Is it a complete epistemology, a "metatheory," a theory of knowledge, a guide on how to theorize? Should the marxian dialectic be used in understanding (and changing) the natural world, or is its utility limited only to discerning the structures of society and its laws of motion? I have not found these questions easy to answer, even when I had full access to relatively comprehensive marxist libraries, for marxist scholarship has not arrived at any clear consensus on any of these questions. FIRST: Marxism is open-ended and dynamic, continuously evolving in ways reflective of the growing richness and complexity of society itself. At any rate, it did not spring forth from the head of Herr Marx fully formed and infallible. SECOND: Many of those who would dismiss marxist thought either as a way of thinking or as a premise for life and struggle, do not understand it, or worse, did not even summon the requisite scholastic discipline and intellectual creativity to attempt to understand it. On the Philippine left. The capacity to adopt and to negotiate the twists and turns toward socialism is the hallmark of a true socialist vanguard party. There was a time, though, from the late '70s to '83 when the communist Party of the Philippines enjoyed a prestigious position in the world communist movement, even among victorious CPs. Its rapid development (and the rapid escalation of the Philippine revolution) since its founding in '68 and the preservation of its organizational integrity in the midst of crumbling CPs caused by the Sino-Soviet schism accounted for this prestige. Also, Guerrero's Specific Characteristics of our People's War, was widely (albeit gradually) recognized as an authentic contribution to world marxist scholarship, as a creative application of Marxist revolutionary theory in an archipelagic social formation. The Philippine CP's prestige plummeted, however, in the wake of its mishandling of the 1986 Marcos snap elections. marxist appropriation of the Hegelian dialectic). On BISIG's paper, I recall being impressed by its presentation of its vision of a socialist Philippines but I do not remember if this paper also discussed the problem of how to get there. The BISIG paper was an implied reproach directed at the dominant left formation (the CPP) and its timidity in openly presenting its own agenda, and defending the same in the open "marketplace of ideas." On Popoy: his break with the main left formation (the CPP itself) and his rejection of the CPP's line of march represent the CPP's failure to recover from its strategic blunder in boycotting the 1986 snap elections. They represent lost opportunities for the CPP to theoreticize on its past victories and failures, and to carefully mine for lessons the experiences of recent socialist victories and struggles. They represent the CPP's myopic and hidebound adherence to old paradigms and formulas. They represent the untenability of containing debate on political economy, political lines, strategy, and tactics, within inflexible and narrow party structures and procedures. Popoy, his break with the main left formation (the CPP itself) and his rejection of the CPP's line of march also represent that continuing capacity of the Philippine left for vigorous theoretical effort and political self-development. On national democracy, I have always found it excruciatingly difficult to conceptualize national Democracy as a distinct economic phase presided over by a state consisting of workers, peasants, and the national bourgeoisie. Imagine this: the insurrection is victorious, state power has passed to the workers, the workers are armed. And then here comes the CPP telling them to please lay down their arms and report back to work to their respective factories and their respective "nationalist" capitalists, and support a government shared between workers and capitalists. Possible? Of course not. You seize power, and you keep it! You use capitalist methods to develop industries and the markets, you institute true redistributive land reform, but you keep state power! In short, national democracy is not a distinct politico-economic phase before socialism, but may be a necessary early economic stage right after the proletariat has organized itself as the ruling class. In short, because the Philippines is capitalist, the Philippine revolution should be socialist. I wonder if the idea of the local economy's integration with world capitalism is inherently contradictory with the future advent of world socialism. Technological advancement is the engine for both world capitalism and socialism, after all. Try this on for size: on a global level, technology has made life so simple. A single person could run entire railroad systems by pushing buttons. Would there be still a need for an intermediate managerial class to tell the operator how to run the railroad and to manage the freight business? In other words, would not technology itself, and information, erase the difference between intellectual and physical labor? Would not the eradication of this difference signal the passing of capitalism and the advent of socialism where everyone works and where no one merely "owns"? All societies have an economic base and a superstructure. The economic base determines the type of superstructure a society has. For example, in feudal times, the landlord-tenant relations are predominant. Economically, the tenant is tied to the landlord by paying the rent. The tenant does not own the means of production which is the land. The superstructure then is a feudal ideology that reinforces this tenant-landlord relations. The church was utilized (fatalism, supernatural spirits, etc.) , and social relations revolves only within the tenants themselves, and the landlords within their own network that extends up to the monarchy which was the political superstructure at that time. We refer this to medieval ages in W. Europe. is Marx's theory of profit. Mao Tse Tung has demonstrated an extreme version of Marx's humanism when he crossed the Yang Tze river saying that it is "Human will that can change society". He did this by forcing millions of Chinese to the countryside under his collectivization program- "The Great Cultural Revolution". Being a hero is relative. To many, Popoy is a hero. He represented pro-labor ideas that not so many people had the testicular fortitude to stand for. He walked the gangplank and he knew, like Ninoy (sorry for the limited comparison), that he will either be jailed or shot in cold blood. He chained-smoked perhaps because he knew that nicotine won't kill him. Equating Popoy to the three assassins hammered into my cerebellum like a kick in the crotch. Hope you said it only to illicit views on what Popoy really represents. For all we know, the three assassins did it only for money (although I doubt this as well). Yes, he lived and died by the "sword", but it was a choice he made. He went through both the living and the dying part by choice. To me, somebody who makes a choice in this world and stands by it come hell or high water deserves my highest respect. He may not be a hero in the magnitude of Ninoy or Rizal, but to me he is respectable. Respectable enough so as not equated to nameless assassins. There are at least a couple or so positive things learned from the Left. One, Marx spoke of "alienation" or being detached, lost from one's original purpose or from the fruits of one's labor, or being stripped of one's dignity and humanity. Though this is not exclusive to Marxism and socialism. Religions, and philosophies, Western and Eastern have dealt with this. But Marx's was quite incisive on this in a social and economic setting. Another is that of social justice -- of fairness unconstrained by the letter of the law or formalities of morals and ethics. It may thus stream from compassion on the poor, exploited and oppressed. And this is what has caught time and again the concern and sensitivity of youth. Marx's thought could have been balanced and much safer -- if it had the idea of "the natural rights of man -- on life, liberty, property ..." as espoused by political thinker John Locke. And this has intrigued me: Karl Marx was a Jew, and Jews and the ancient Hebrews have the tradition of respecting the life and dignity and individual human beings; their Yahweh said: "... and thou shalt not have slaves, for were thou and thy children not slaves in Egypt." Perhaps, he was not a practising one. Unfortunately, Marxism has been a cover for authoritarian, dictatorial personalities who have the obsession for absolute power over their fellowmen, resulting to extreme cruelty and inhumanity. Yet, on the other hand, there are two other covers for such perverse characters -- being anti-communist and the other espousing that "greed is justified by capitalism." Just some thoughts on Popoy Lagman representing pro-labor ideas. Lagman could indeed have represented pro-labor ideas but he could just as well have been fooling everyone by giving them false hopes. The truth to this will forever be buried with him. The popular path is also not always the right path. I would agree that Lagman is popular with the labor unions. But I'm not "yet" convinced his prescriptions are correct. Though capitalist systems are flawed, leftist ideas are yet untested in our setting. Though in times of need, they conveniently serve the leftist movement as the proverbial "light at the end of the tunnel". I'd probably call Lagman a "popularity hero", much like Erap was to squatters after promising them homes. False hopes. I also believe that not all medicine is good medicine. And one which involves taking lives (ABB-style) is most likely to be the wrong pill. His call for a "Rebolusyon!" during the anti-Estrada rallies reeks of disrespect for the Constitution and cast doubts on his real motives. Again, the truth will forever be buried with Lagman. Just some thoughts: If Popoy's life expired in a less dramatic way (i.e. dying by old age or lung cancer), would he be accorded the hero's praise that he died for his noble causes? I heard somebody mention after seeing the thick crowd at UP Chapel that Filipinos are really thirsty of heroes. If we don't have one, we'll make one. Binky, just some thoughts on your thoughts: If Ninoy and/or Rizal died of old age or lung cancer, would they have been accorded the hero's praise? Would one regard Villar a hero had he been shot in the skull immediately after he forwarded the articles of impeachment to the Senate? The drama makes the hero. So does it make the villain. Who's who depends on where you stand when the shot rang out. Hero is relative. The above notwithstanding, I think the man did not have dreams of being regarded a hero anyway. He did make articulations on wanting to change people's lives. The thick crowd at the UP chapel was not about making a hero out of a non-hero. I Think it was about Popoy Lagman, BMP, period. Ozone, thanks for bridging some of my thoughts. I can concede that a hero may be relative. I also think that what makes a hero is not only what he is but also what he stands for and how he affects other people. I would just like to differentiate the man from his cause. Pro-labor issues are noble causes. And not only Popoy holds the torch of that advocacy. Admittedly, he has done a lot in popularizing the causes of the workers in every way he knew possible. I won't argue that we still need the best of people to champion the causes of the trade union movement in this country. Binky, I think that while your thoughts have merits and its true that not only Popoy holds the torch of pro-labor advocacy, I still think that the ma, dead as he is now, still deserves to be defended against ideas that equate him with criminals. Yes, any man does not deserve to die in a violent way. And I do not glorify Popoy as ABB. Rather, his ABB days may simply be taken as the dark days of his life story. A man has got to go through what others call "baptism by fire". Somehow, there were forces in the old society wherein Popoy grew up that made him choose that path. Regardless, I am pro-Popoy as BMP. Interesting that the left in the Philippines could be resentful of their mass reduction in unemployment, rapid growth in real wages. There was never a welfare state to disparage, so they can scarcely miss one. Hold a thought for those 'rich countries' which still have their 'poor' unskilled workers who have not seen a real pay increase in 2 decades because of the flood of unskilled jobs going offshore. Capitalism is transitioning after emerging market dictators precipitated a pent up supply of labour in their markets, which was suddenly released in the 1990s, amidst a power crises and degraded infrastructure, which you people know too well. But of course the Left can always compare their lot with those who have more, and resent the nature of humanity which is production, not predation.